After "Belief-O-Matic" revealed my best religious fit as Neo-Pagan, I was eager to find out more. Coincidentally, I signed up for Second Life. Since Neo-Pagan was much like Pagan, searching on that term quickly brought me to the partying pagans of Artemis Tavern. When the tavern DJ, who also happened to be a landlord, heard that I was looking for a quiet plot to build a grove, he prepared a vacant parcel for me. I added a bunch of free and reasonably priced prim trees, building my grove with a clearing in the center. There I placed a meditation pad, a freebie magical goddess fountain and a field of particle flowers. After a few weeks of dancing the ubiquitous "dream dance" in my sacred grove, I felt more grounded and peaceful in first life and more tuned in to the ebb and flow of energy. Borrowing from rituals in world and resources off world, I created simple rituals to manifest intentions in both worlds. 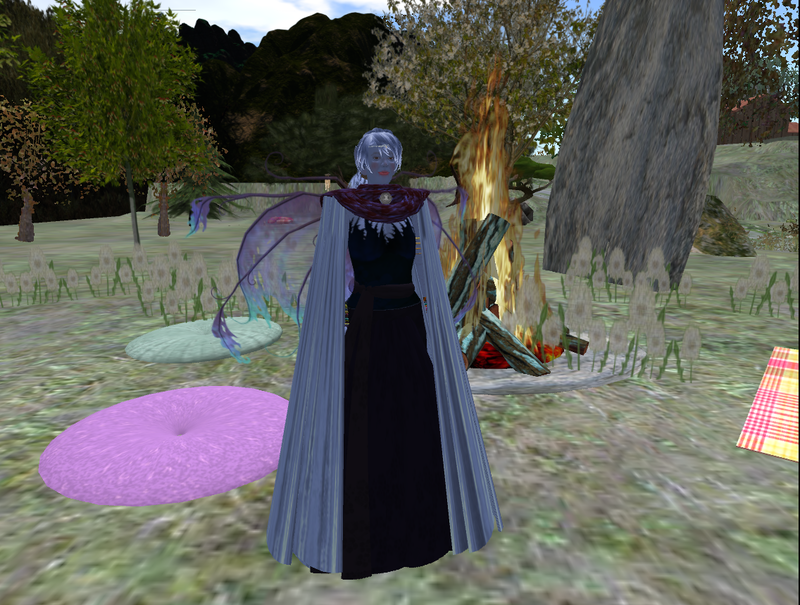 Sometimes I performed a ritual in SL and repeated it in first life and other times vice versa. The energy barriers between SL and first life dissolved. 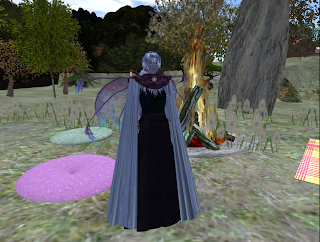 To explore those changing energies, I transformed the plot variously into a standing stone circle, a fire altar with candles, a simple prim cave, and covered it with sculpty water. My first life practice areas did not correspond exactly but that didn’t seem to matter as long as I worked similarly with the energy in both realms. I moved on to terraforming, having found a water parcel in a quiet residential neighborhood. I transformed the parcel from a grove with a tree house, to beach property, to goddess meditation temple, and then to underwater nature center. In first life, my practice became increasingly complex as I began working with the cycles of the moon. In SL, I built a moon altar at 1400 m, leaving the ground area for public display. I can tell you it is possible to do too much. I remember one new moon when I performed two in-world rituals and two off-world rituals within 24 hours. Instead of multiplying the energy into a frenzy of manifestation, I was becalmed. The energy stopped and nothing happened – fortunately. Since then I’m a little more careful, experimenting gently to balance in-world and off-world practices. So, I have learned whether in SL or first life, it is the same. What matters most is intention and infusion, whether in electrons and pixels or earth and moonlight.